great juice very quick delivery will buy again and highly recommend this company and its juices. Arrived and was clear in colour as other choco vapes i had had been darker i was skeptical but after speaking to Tony he assured me the chocolate flavouring he uses is clear and won t clogg coils after trying the juice was blown away tastes great just like a crunchy bar without being sickly sweet so far coil is clean. 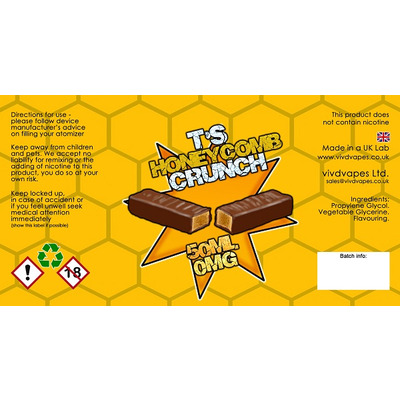 Will be buying more of this and highly recommended if your into choccy vapes. 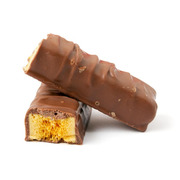 We bring you a Honeycomb Crunch, a rich chocolate and honeycomb flavour. 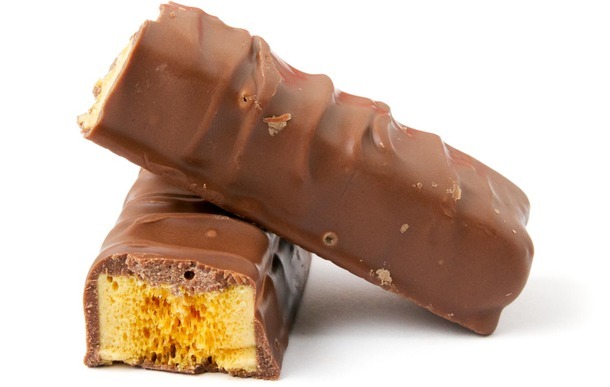 On inhale you get a lovely rich dark sweet milk chocolate then the exhale combines with honeycomb to give a great replication of the much loved chocolate bar. A lovely chocolately treat, is not overly sweet and will not kill your coils or rot your teeth. After many tries we managed to get a chocolate that tastes like chocolate but won't kill your coils. 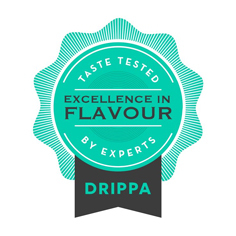 Juice is pre steeped ready to vape but only gets better and better with time. This 50ml 0mg bottle has been formulated extra strong flavour or to take 10ml plain vg to give a correctly blended 60ml 0mg 70vg, or a 10ml 18mg vg nic shot will give 60ml 3mg 70vg juice, shake vigouroulsy for 2 - 3 mins leave to stand until bubbles are gone then enjoy. BEWARE THIS IS A DIY PRODUCT AND WE ACCEPT NO RESPONSIBILITY/LIABILITY FOR THE USE/MIXING/DILUTING OF THIS PRODUCT YOU BUY/USE IT AT YOUR OWN RISK.